still not feeling 100% but able to roost now! My Husband And I Raise Chickens. We Are Fairly New At It But It Has Been A Goal Of Ours For A Few Years Now As We Embraced The Off Grid Lifestyle 4 Years ago And Try New Experiences And Experiments To Be Self Reliant. 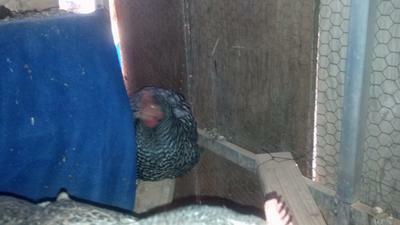 We Started Out With A Small Flock Of 8 Hens, All Good Layers, And Even A Couple Of Good "Mousers" Among Them. Eventually, One Of My Favorite Australorps Became Eggbound And Died. We Didn't Recognize The Symptoms And So Were Unable To Save Her. Then Just This Week, Another Favorite Of Mine, A Very Pretty Barred Rock, Developed Weird symptoms. She Swelled Up So Badly That Even Her Neck Disappeared And Her Head Appeared To Just Sit In The Middle Of Her Extremely Swollen Body. She Couldn't Walk And Would Just Sit By The Water Bucket And Sleep. I Researched Info But Nothing Seemed To Fit These Particular Symptoms.Finally I Decided To Put Raw Apple Cider Vinegar In The Water Since It's A Natural Antibiotic And Figured It Might Keep The Others From Catching What She Had As Well As Treat her. Later That Day, Her Swelling Had Gone Down A Little, And 3 days Later She Is Acting Almost Normal. I Have Kept Adding The Acv To The Water Everyday And Nobody Else Has Developed Symptoms So Here's To Crossing My Fingers And Praying Real Hard. Has Anyone Else Living Off Grid Raised Chickens? What Has Been Your Experience Keeping Them Healthy And Happy?